Heat a sauce pan over medium heat and add the cream, butter, garlic, salt, and pepper. Whisk constantly until the butter is melted and the mixture comes to a slow simmer. Whisk constantly until the butter is melted and the mixture comes to a slow simmer.... Directions. Melt butter in medium saucepan with olive oil over medium/low heat. Add the garlic, cream, white pepper and bring mixture to a simmer. A little butter and garlic, something to thicken up the milk a bit and you are in Alfredo heaven. 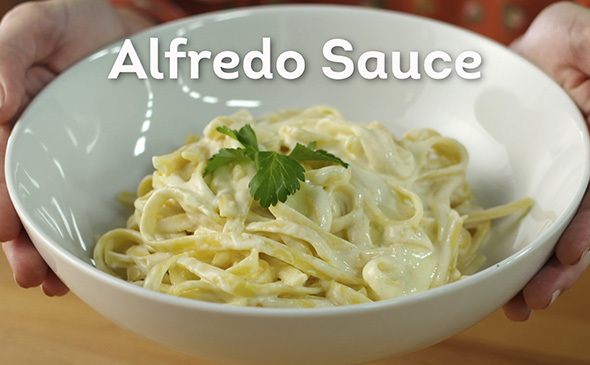 Traditional Alfredo sauce is made with milk or cream, butter, and garlic. We tolerate raw dairy in our house well, however I find myself making Alfredo sauce with �... Heat a sauce pan over medium heat and add the cream, butter, garlic, salt, and pepper. Whisk constantly until the butter is melted and the mixture comes to a slow simmer. Whisk constantly until the butter is melted and the mixture comes to a slow simmer. A half cup of butter is a whole stick, which has 240 mg of cholesterol, and 56 g of saturated fat. And that doesn't even include what ever is in the cream, which OP stated is also a 1/2 cup per serving, and I don't have a carton of it to read the label of.